From Chris Vermeulen: Even we were concerned with Bitcoin briefly traded below $6k in late June. Yet, the recent upside price move was incredibly quick and the price of Bitcoin ran right up to our upper price channel. We believe this will become a new price peak over the next few days/weeks where the price of Bitcoin should continue to drop from these levels near $7500. We know there are many Bitcoin investors that want to hear us state that it should continue to push higher, but there are other factors at play here that may limit this movement. The price channels that are currently constraining the price of Bitcoin originate back in February and March of 2018. The low and high price rotation within these months start the points of interest for our research team. From these points, we have continued to identify key price levels that appear to contain breakouts. You can see from the chart below, the upper BLUE channel line is our downward sloping price channel that is acting like an upper ceiling for the price. Additionally, you can see our “drawn Red and Green arrows” showing what we believed Bitcoin would potentially do over the next few months. We believed that Bitcoin, as it traded lower, towards $6k, may find support and rally (based on our time/price cycles) towards a peak near July 16 (showing as the end of the Green Arrow). From this point, we believe the price of Bitcoin will trail off, heading lower, with the intent to retest channel support near $5700 if the price cannot break through and hold above the blue upper channel. 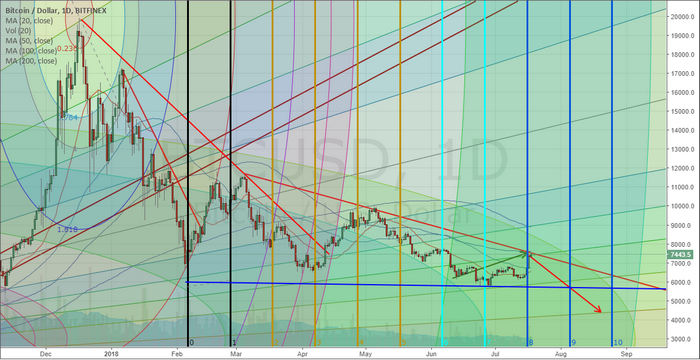 This longer-term daily Bitcoin chart shows a larger picture of our analysis work. You can clearly see the channels that are constraining price at the moment – the BLUE support channel and the RED resistance channel. The most recent lows established a new lower price point for the Blue channel – which indicated a downward sloping pennant formation is in place. There are two things we want to caution Bitcoin investors and traders about. First, the rotation that we are expecting to complete this pennant formation could happen very quickly within a fairly tight range ($7400 to $5700). For traders, this is an excellent range for some quick profits. For investors, this could create some stress as price rotates. Second, by our estimates, at least one more low price rotation is required before any real breakout will be attempted. If our analysis is correct, this current price peak will end with prices falling back below $6k, forming another “lower bottom” and rallying again to near the upper price channel (near $6700 or so) before trailing off for the last time – nearing the apex of the pennant formation. We believe the current outcome of this price setup will be a low price breakout, forming a potential wave 5 that should end near or below $5500. After that bottom is reached, we should be looking for a new bottom formation setting up a new advancement leg higher. Could our analysis change, of course, it could depending on what price action shows us. Right now, this pennant formation and the wave counts are driving our analysis. The Time/price cycle analysis helps us to determine when and where price target/peaks/troughs may happen, but they are not set in stone. If you are a trader and are long Bitcoin, this may be the highest price you will see over the next few months. If you are an investor and think this is the start of a bigger move higher – we don’t agree with you. We believe we are very close to the final leg lower that should form the new price bottom – at least for a while. 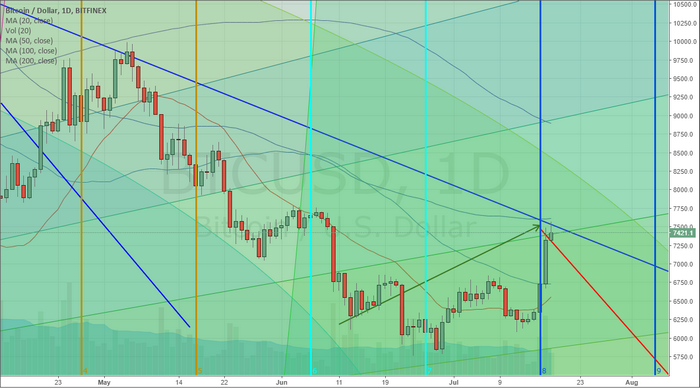 Once this bottom forms, we’ll be able to provide a better understanding of what we believe will happen in the future. For right now, our target low for the bottom is $4400 on or near August 20, 2018. We’ll see how it plays out. We keep a close eye using our proprietary ADL Fibonacci and ADL Cycle forecasting systems using the Bitcoin investment trust which trades like a stock/ETF, the symbol is: GBTC. Tags: Bitcoin Bitcoin(CURRENCY:BTC) BTC Chris Vermeulen cryptocurrency currency CURRENCY:BTC Technical Traders Ltd.